Best Coldest Night of the Year so far! • Best Coldest Night of the Year so far! Another fabulously fun, family-friendly Coldest Night of the Year Walk in the books for 2017. With over 175 walkers, we had a fabulous turnout. Local residents and sponsors from businesses and media around town braved the cold (and it was COLD!) for the event to aid Lethbridge’s hungry, hurting and less-fortunate. Check out some photos from the day, and read on to find out our record-breaking total for the 2017 Walk! Please also check out Austin Moloughney’s album Coldest Night of the Year Lethbridge 2017 for more Walk photos! “We are always so humbled by the response we receive from this Community. This year’s walk is no exception. 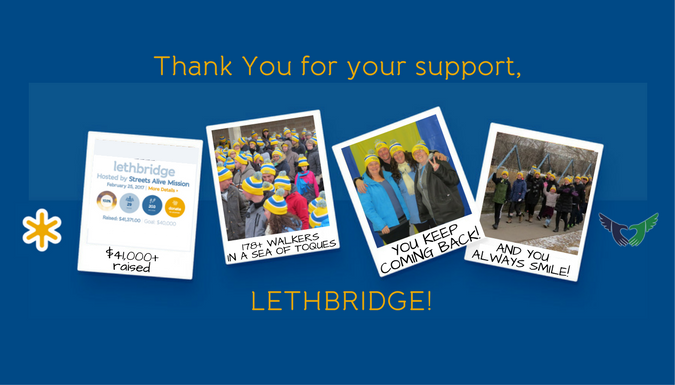 To see our numbers grow both in the total amount collected and in the number of walkers and teams supporting us, shows how deeply committed Lethbridge and the surrounding communities are in battling poverty and making sure that those of us committed to that work, have the resources we need. Poverty is a huge problem, but having the communities support makes the hard work much easier to do. This year was our most successful walk in the 6 years we hosted the event, raising a record $41,000+. The coveted ‘Breadmaker’ trophy for the most funds raised by a team went to ‘E-Free Church Birds of a Feather’, who raised an outstanding $3,675, all to help the less-fortunate in Lethbridge. Streets Alive Mission appreciates the community sponsors for this event and would like to thank them for their generosity and support, especially the Lead Sponsor RBC Hass Wealth Advisory Group.